It was a day to remember at Hemel Hempstead Camelot Rugby Club as 72 youth rugby teams from 19 Hertfordshire clubs turned out for the U11 and U12 County Festival. An estimated 3,000 visitors attended the event as Camelot U11s won all five of their matches to cap off an impressive campaign. They lost just one fixture all season, running out as festival champions at Banbury, while both their A and B teams became festival champions at Maidenhead. The U12 competition, meanwhile, was comprehensively structured – allowing most teams to compete for trophies – and the Camelot U12s beat some of the best teams in the group stages before finishing as valiant runners-up in the Plate final. Summing up their season, team coach Dave Martin said: “Seeing all the parents pull together for the festival was one of the highlights. “We play with a smile on our faces and our aim is to win friends in rugby and occasionally the odd game.” This enlightened approach is perhaps the reason their squad has so many players and why they have only lost one fixture all season. Helping out on the extremely successful day, visiting Saracens and Scotland international Kieran Low mixed with teams and parents, while Hemel Hempstead MP Mike Penning presented the trophies and medals. 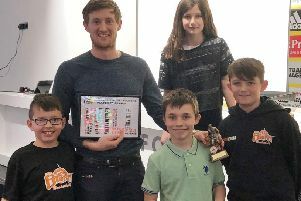 A Fair Play Cup, sponsored by local firm Jay-City Finance, was awarded to Hertford Rugby Club whose players, coaches and supporters were consistently fair and complimentary of other teams – a great example of excellent sportsmanship and how rugby should be played. Parents and RFU delegates were impressed with the level of organisation and smooth running of the event. In recognition of the considerable support given by the community, Camelot thanked the Boxmoor Trust for allowing them to use the old golf course fairway for parking, Hemel Railway Station and St Roses School for free use of their car parks, and particularly the nearby residents at Chaulden Lane for putting up with the inconvenience of so many visitors arriving on their doorstep. Sainsburys at Woodhall Farm, Spar at Leverstock Green, and Co-op at Bellgate all donated supplies of food and drink, while signage for the festival was donated by Wel Building Supplies and Clements Estate Agents. The Snow Centre was also a sponsor, while Emma from the Boxmoor Direct free magazine project-managed and edited the festival program. Premium Force donated new corner flags and poles, and Deacons Tree Surgery improved all the pitch access pathways. Event photography was provided bywww.take2eventphotos.co.uk. Camelot also praised the club members who readily gave up so much of their time, and to the exceptional Rugby World Cup volunteers who came from other parts of the county to help out on the day. The club will be hosting similar County Festivals for the next two seasons, and without this kind of commitment from community-minded individuals all pitching in together, putting on a fantastic display of youth rugby in a fair and safe environment would not be possible.